Very nice high quality Nissan Z car style keychain by Auto Art. The mechanism to insert the keys is extremely easy to use and secure - worth the price alone. Click for photos and information. Excellent ornament for your Christmas tree. It is over 4" in diameter, and comes in a cool collector's box. Click for larger photo and more details. Another great conversation piece from Auto Art. It looks real - seriously! You won't believe the quality. At 13" in diameter, it is the size of a real racing disc brake and caliper. Click for larger photos. Only a few left! Cool piston key chain. You can add this to any order without paying additional shipping charges. Click for larger photo. 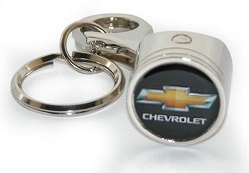 Cool piston key chain. It was discontinued due to licensing issues. I only have 1 left!